The port of Tauranga in the Bay of Plenty claims to be New Zealand's largest and most efficient port in terms of general cargo through-put and the second largest in terms of container handling. The harbor has been used by European traders since the early nineteenth century and was probably visited by whalers and sealers even before that. Missionaries from the Bay of Islands region visited as early as the 1820s and a flax trader by the name of James Farrow established himself there in 1829 buying flax from the local Maori chieftains in exchange for muskets and gunpowder. A Catholic mission operated there from 1840 until 1863 when it had to be closed because of the Maori wars. 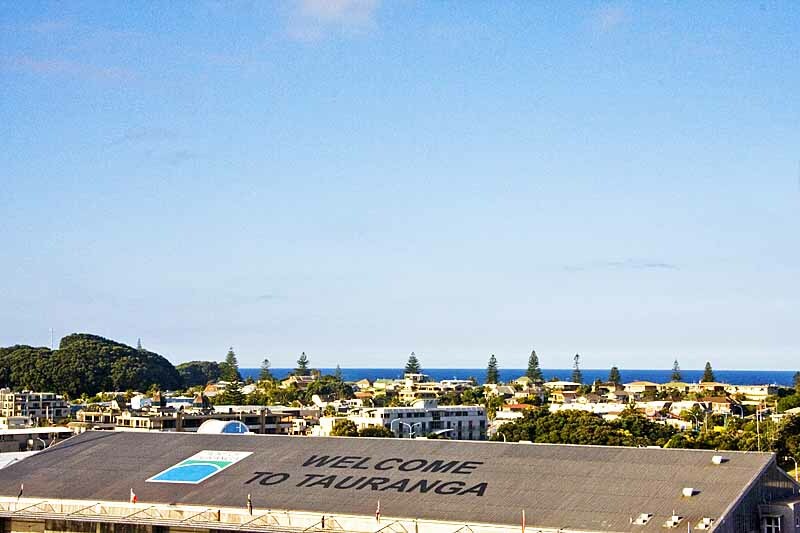 Today, the city of Tauranga is an important economic center and has a significant component of retirees within the general population. We decided to spend the in-port day driving through the countryside to Rotorua instead of our usual urban walking adventure. It was a very relaxed itinerary during which we rarely knew where we were other than in general relationship to Tauranga and Rotorua. One of our several stops was at a stream-side park that we serendipitously happened across. Another couple that we had met on the ship and who had actually organized the outing accompanied us on our explorations of the park. It was a delightful interlude filled with strange and not so strange plants. The New Zealand land mass made its way to it's present location on the globe a very, very long time ago and has been isolated from other land masses for most of the journey. As a result, not only does it have a lot of strange animals, but it also has a wide variety of unique plants and trees. 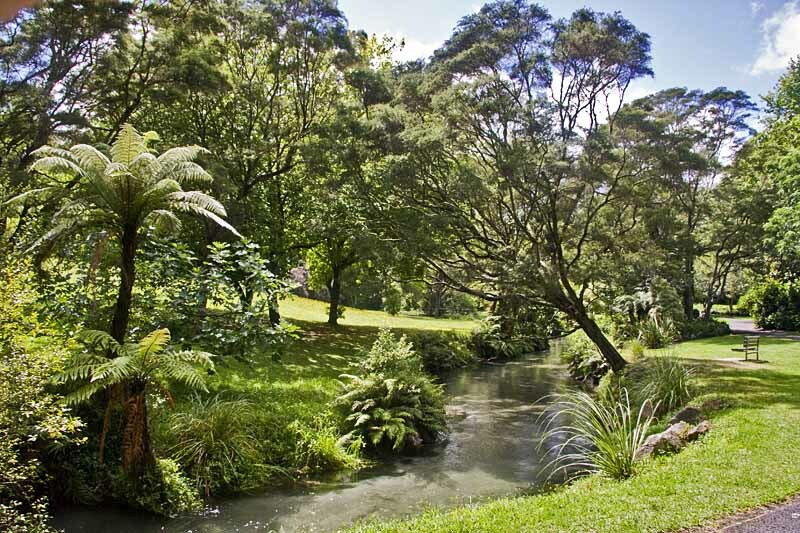 It is estimated that over eighty percent of the plants in the country are endemic to New Zealand. 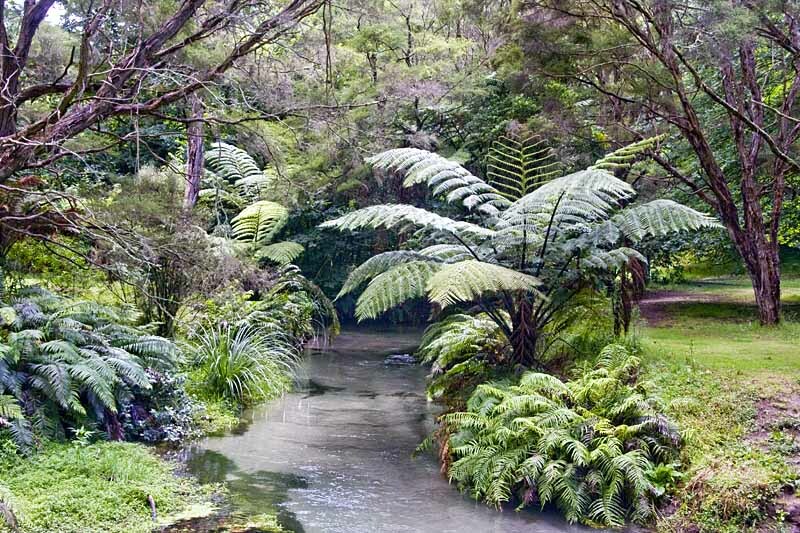 One of the things that we found to be particularly interesting was the number of huge tropical ferns that were growing in New Zealand's temperate climate. 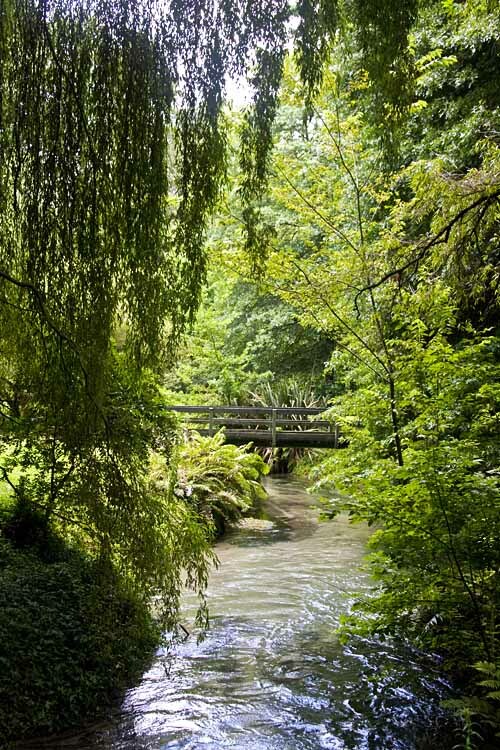 New Zealanders love their forests and parks. About twenty five percent of New Zealand is protected wilderness and every community that we visited had important areas set aside as park land. From our observations during this trip, the Kiwis use their parks and take very good care of them. Those plants that are found elsewhere are usually larger and mature more rapidly in New Zealand than in other places. The New Zealand forestry interests have taken advantage of this fact to introduce a California Pine and the Canadian Douglas Fir. In North America these trees typically mature for harvest in about ninety years. In New Zealand they can be harvested after thirty years.